During Spring 2015, OAA, academic units, Enrollment Services, and ODEE partnered to develop a five-year enrollment plan for distance education. Distance Education is woven into the fabric of the institution. ODEE’s role is to manage the five-year enrollment plan initiative, while respective partners and stakeholders are expected to meet the goals identified in the plan. Much of the FY17 work will be supporting academic units and student support units to meet their FY17 goals and be set-up for FY18 and FY19 success. Managing the plan is necessary to achieve enrollment goals bringing net new students and new revenue sources to the institution. University staffing and growth plans are based on projected institutional revenue, thus meeting or exceeding goals are of great importance. Additionally, distance education is supporting university goals for student affordability, access and success as student experiences and expectations continue to evolve in higher education. Distance education programming at Ohio State will grow from 10 online programs to 35 and from 470 students to 3,000 by FY20. Achieving and maintaining enrollment and revenue goals will allow the institution to maintain projected university financial and personnel resources. Realize a comprehensive quality assurance process for online courses and programs with university partners. Risks: Because the five-year plan is woven into the fabric of the institution, factors outside ODEE’s control, such as college curricular decisions and direction, university approval processes timelines and non-distance education activities outside Ohio can adversely impact revenue and university support plans. Benefits: Continued staffing, growth and revenue generation for ODEE, OAA, and colleges participating in the plan. The Enterprise Project is a business process transformation and system implementation that will leverage Workday and other enterprise technologies to advance Ohio State’s Time and Change strategic plan and teaching, research, service and patient care missions. It includes optimizing finance, HR, payroll, student services and IT business processes; replacing core administrative systems (currently PeopleSoft) with Workday; and improving decision-making through a single source of trusted administrative data. Modern systems. More efficient processes. A better work day. At its core, the Enterprise Project will change the way the university does business. By leveraging modern systems and more efficient processes, Ohio State faculty, physicians, staff and students can spend more time on mission-driven work, and less on administrative tasks. Our current administrative systems are outdated and inefficient. They cause inflexibility in business processes, and business and technical risk due to their age and customization. Updating these systems and the processes together provides tremendous opportunity to move Ohio State forward. Your time is important. Period. The Enterprise Project will give you tools and resources to maximize your time in the classroom, laboratory, hospital or office. Through improved self-service tools and easier access to trusted business data, you will truly be able to make the most of your day. A single system for the entire organization. Ohio State is implementing Workday for the university and Wexner Medical Center’s financial, human resources, payroll and student information systems. That means one system for all of your Ohio State business support needs: one version and one experience for one Ohio State community. When the university community assessed the need to replace the current Financial, HCM and Student Information systems, a set of key drivers or reasons to consider moving to a new modern system emerged. The Enterprise Project Governance Structure is comprised of Process and Business owners, Business Advocates and Executive Sponsors. Refer to the Enterprise Project site for the latest timing information. 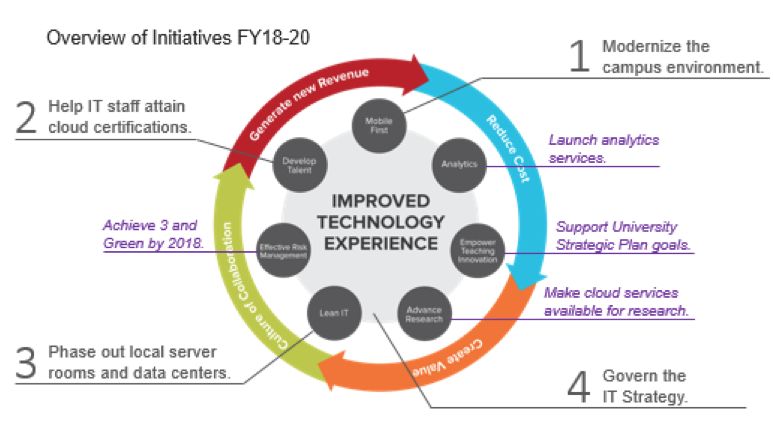 The University IT Strategy is a collaborative effort by central and distributed IT leaders at Ohio State to co-invest in solutions that deliver a more seamless technology experience for students, faculty and staff. The Strategy identifies 7 investment areas that, taken together, will modernize the campus IT environment and support the University’s Strategic Plan. The areas are: Mobile First, Analytics, Empower Teaching Innovation, Advance Research, Lean IT, Effective Risk Management and Develop Talent. The 4 goals under this OCIO Top Project will strengthen central/local IT partnerships and make significant progress towards a more seamless technology experience. We must work in partnership across the university to provide a modern, seamless technology environment for students, faculty and staff. Improved technology experience, partnership approach to providing the right IT at the right levels, decreased cost for some types of IT expenses. Risk of driving forward efficiencies without providing an improved more modern experience. Help IT staff attain cloud certifications. Phase out local server rooms and data centers. This effort continues the work started in FY15 to bring the university to acceptable levels of managing information risk, in order to address information security threats to our systems. It includes work such as: moving data centers to the SOCC, stopping email forwarding, addressing email retention, and consolidating networks. Not only do external regulators require that our health, financial, student and research data be securely managed, our students and partners have an expectation of data security that must be met. This effort will ensure we can demonstrate that we are managing information risks according to regulatory requirements, and should result in fewer unplanned data incidents. November 2016: University achieves an average of “3” for all risk areas. Risks: Regulators can level fines for non-compliance, the university can incur significant additional unplanned expenses to remediate data incidents. Our ability to receive federal funding for student financing, or research, may be at risk. Benefits: Positive outcomes include more efficient operations, lower costs for external audit response, decreased incidents, improved technology capabilities and demonstrating management of risk to regulators. This is being managed by colleges and units as an ongoing governance initiative overseen by the Board of Trustees, and as such, there is no need for a project manager. Timeline: Content Camp and Engage pilots will be completed in FY18, and research on the success of affordability initiatives will be published in FY18. We want to support President Drake’s goal of making college more affordable for our students. We also want to facilitate OSU being a leader in this arena, saving students money, helping faculty adopt/adapt material at low or no cost. Success includes long-term financial savings for students, recruitment for grant cohorts, ongoing project support, and continued progress toward $10M by 2020 goal. Successful pilots, lessons learned and plans to continue. Content Camp, support the development of 3,000 open assessment questions across 3 disciplines, assess long-term project opportunities and design future roadmap. Pilot Engage tool – assess the feasibility of delivering low-cost textbooks to students through Engage digital reader, work with Unizin to address tool accessibility. Benefits: Saving students a significant amount of money while supporting excellent pedagogical practices. OSU faculty influencing outside of Ohio State. Risks: Not making savings goal, some content doesn’t exist, is hard to source/create. Sustainability is an unanswered question. The Business Intelligence, Analytics and Reporting (BAR) workstream under The Enterprise Project will produce reports and dashboards in Workday and establish a Reporting and Analytics Environment (RAE) in Amazon Web Services (AWS) for dashboards, scorecards and enterprise data used with other reporting tools (e.g. Tableau) outside of Workday. The Analytics Services top project extends these efforts by establishing ongoing service operations for the RAE, making both Workday and non-Workday data easier to find and use through a searchable data commons, and aligning related efforts university-wide under the Analytics investment are of the University IT Strategy. The University Strategic Plan establishes goals with some specific metrics to achieve in five pillar areas. Many types of university data are needed to show progress towards those goals. This effort makes many of those data sets easier to find and use. Empirical research will play a key role in assessing the effectiveness of programs and actions that are intended to help the University achieve the goals of the strategic plan. This effort will make it easier for researchers to find and use university data in formats that are best suited for research. It will take aligned, coordinated efforts by IT and analytics teams across all college and VP areas to ensure timely, consistent access to university data. This effort ensures that the unique needs of each group are taken into account. Reports, dashboards and scorecards defined under the Enterprise project are launched successfully with each go-live. On-going services that support the RAE environment, including Tableau, the Data Lake and Enterprise Data Warehouse are in place. It is easier for analysts and researchers to find and use university data, including existing analytics centers of excellence. Define Analytics Services to be launched FY19-20 that are out of scope for ongoing Workday Enterprise Operations. Make it easier for you to find/use data (e.g. Data Commons). Use the Running Lean approach to defining these new services. Focus on making you awesome. Launch new Analytics Services FY19-20. Refine Analytics investment area of University IT Strategy. No more Trick-or-Treat approach to finding data. Managing data definitions, access and security. Refine the Analytics Investment area with College/VP IT and analytics teams. Define which BAR services are rolled out under Enterprise Operations and which BAR/RAE services are rolled out under Analytics Services. Set up services for ongoing operations; identify ongoing funding needs and models. Use the Running Lean approach to set up the services. Complete problem interviews with end users to inform service design. Roll out services aligned with Workday go-lives. The Digital Flagship initiative provides all students at a major public university with a consistent, best in class mobile tablet ecosystem to enhance their learning, research, and life experiences while on campus and beyond. This program strives to not only improve the current day to day experiences of our students, but also provide them with skills to better prepare them for the modern mobile workforce, focusing on mental & physical wellness as well as digital, information, and financial literacies. As technology start-ups and industries continue to grow and flourish in Columbus, and Ohio as a whole, this initiative looks to increase Ohio State student talent and skills in the area of coding and entrepreneurial app development to ensure innovation and creativity blossoms across our communities both near and far. This initiative is focused on the student experience with a heightened effort to provide Ohio State students with the best experience possible while enrolled at the university, while at the same time providing them skills and experiences that will prepare them for their future careers. Initial success will be providing students with an iPad and outstanding support around their user experience. Long term success will be integrating coding across the Ohio State community and fostering a culture of technology innovation and entrepreneurship. Additionally, future years will focus heightened faculty engagement with existing eLearning tools and embracing a mobile teaching and learning ecosystem. Pilot and implement systems, policy, resource, and processes for student iPad deployment. Create initial coding curriculum options for Ohio State community. Develop plan for enterprise app development and iOS design lab. Committing to our students and providing a new value add to the university experience. Establishing a new focus on workforce development across all major programs and campuses. Creates new student recruitment and private sector business partnership opportunities. Further enhances Ohio State’s standing as a premier public university. Unknowns to providing students with university owned technology.